Please include the personalization desired. Letters and numbers are available. 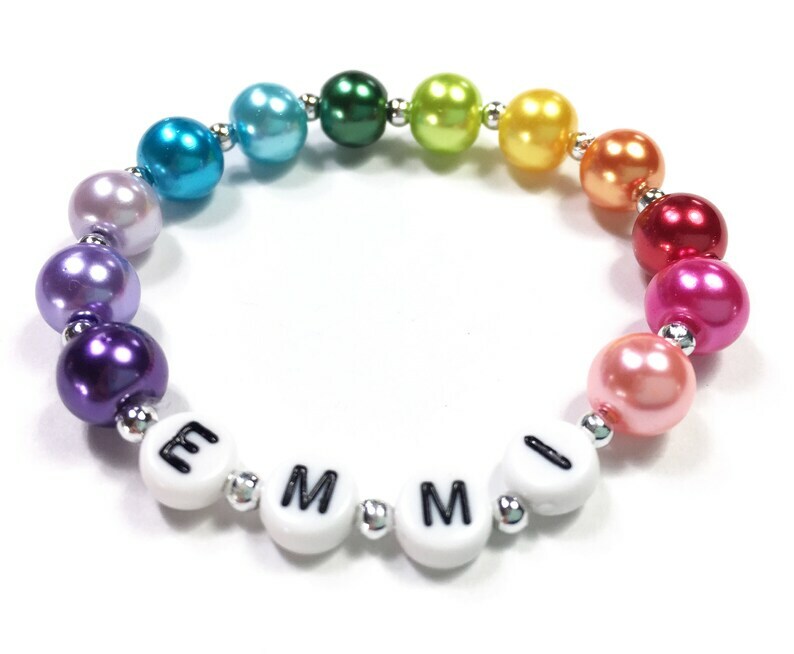 Rainbow Pearl Bracelet. 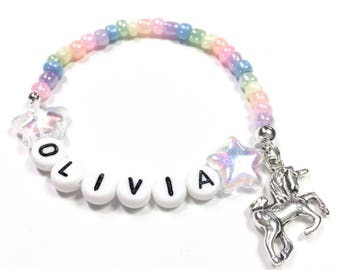 Personalized Rainbow Bracelet. Made with a Color wheel of colors. This makes a great Gift for an artist or Rainbow Party Favors! These are high quality glass pearls on durable stretch cord. Custom made to order. These bracelets are very unique. Each one will be individually designed and customized to the length of your name and the size of the bracelet. Pictured is a 4 letter name in a 3-6 yo size. The number of pearls will vary based on the number of letters and the length of the bracelet. You may receive more colors or less colors. See picture to for more examples on the number of colors you will receive based on the size and length of the name. For example in the case of long bracelets like M/L Ladies size the rainbow may begin to repeat. For newborn size bracelets you'll usually receive 6-7 pearls. We'll include as many colors as we can to complete the rainbow. ORDER INFO - Please include the personalization in the "notes to seller" at checkout. So Cute! A light weight, strong, stretchy bracelet for your child. Made to spell out his or her name, sport, or nickname of choice. Accented with beads. Bead color or dye lot may vary slightly from the ones shown. I had purchased one these personalized bracelets when my niece (now 7) was born. Her and her sister were being rough with it and it broke. Sadness occurred, and they chose this rainbow design. They are gorgeous, done completely as described and requested. It is super cool because the bracelets came in two different color bags, and each niece will be getting their bracelet in their favorite color bag!